The food you throw out every day might be contributing to greenhouse gas emissions. The U.S. Department of Agriculture estimates about one-third of all food produced in the United States is wasted. Throwing out leftovers and food scraps contribute to that number. 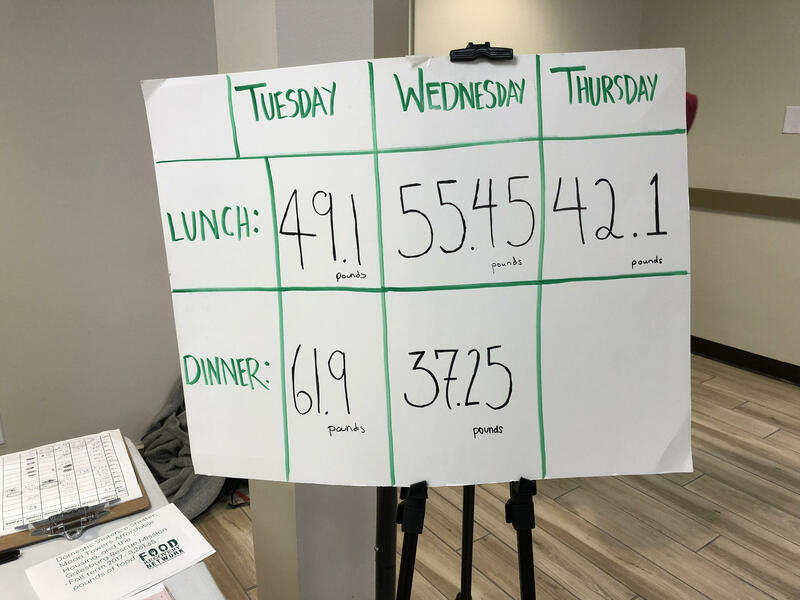 To measure how much food students waste in the Knox College cafeteria, a student organization recorded how much food students left uneaten on their plates. The Food Recovery Network measured about 100 pounds left during lunch and dinner one day in November. The group repeated the study in January and found similar results. 100 pounds per day might not sound like much, but that adds up to 21,000 pounds per year. In other words, on average each of Knox’s 1,400 students is wasting 15 pounds of food in the cafeteria annually. 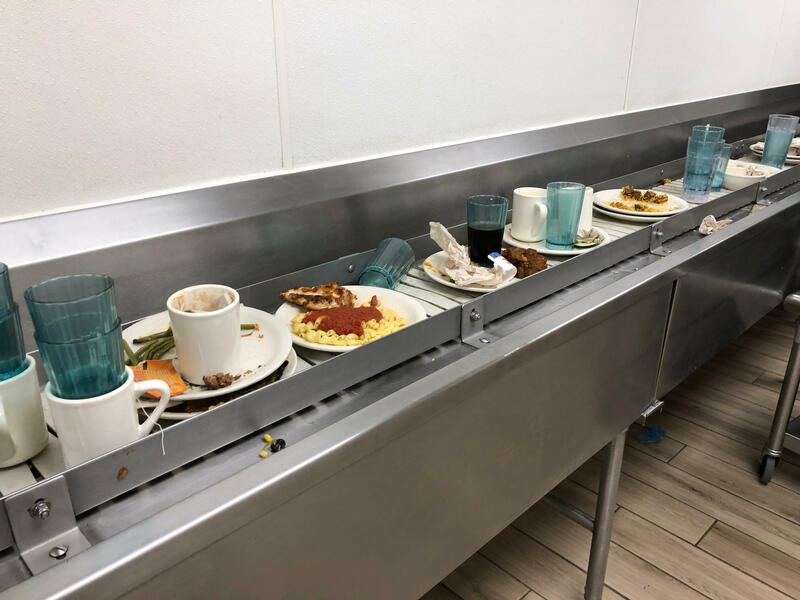 Meryl Davis, President of the Knox College chapter of Food Recovery Network, said she noticed students waste the most food when they take too much from the buffet lines. Davis said Knox used to compost more than 90% of the wasted food. But she said the dehydrator broke about a year ago so that program was halted. For now, wasted food is going to a landfill. The Food Recovery Network aims to reduce a different type of food wasted in the cafeteria. The group delivers cooked but unserved food from the kitchen to local nonprofits. Davis said they recovered more than 13,000 pounds of food last year. Plates stacked on the conveyor belt to be taken to the dish room during dinner on January 16, 2018. All the food pictured was thrown away. Food waste isn’t just a problem in cafeterias. Heather McIlvaine-Newsad, a professor of Anthropology at Western Illinois University, said food waste is a global issue because discarded food from kitchens or grocery stores produces methane when it reaches landfills. She said that’s a concern because methane is a powerful greenhouse gas that contributes to climate change. McIlvaine-Newsad said people can make household changes to decrease the amount of food they waste. “If you go to a little more effort of planning your meals before going to the grocery store and buying exactly what you need, chances are you’re going to have less left on your plate after you finish,” McIlvaine-Newsad said. Results of Food Recovery Network’s January campaign to weigh the amount of food wasted by students in the Knox cafeteria. The campaign ran from January 23-25. However, not all consumers are as proactive when it comes to cutting their waste. Martin Heller, a research specialist for the Center for Sustainable Systems at University of Michigan, said buying too much food can be a difficult habit to break. Heller’s research often examines the environmental impact of the food system in the United States. Heller said raising livestock requires a lot of resources so throwing out meat means throwing out those concentrated resources. He said ruminant animals such as cows can produce a lot of methane due to how they digest food. He said certain diets are associated with higher greenhouse gas emissions. “There are very large differences in the environmental impacts of diets that Americans are eating every day. Those individuals with very high impact diets tend to be those who are consuming a lot of meat,” Heller said. He thinks creating policy about this would be difficult. “It’s hard to imagine a society where we say ‘Thou shalt not eat beef,’” he said, adding it’s up to consumers to make the changes that make a difference. Heller said he is working to involve other researchers in studying how to influence people to make these changes. Heller said people who feel powerless in stopping climate change can make household changes, such as eating less meat, shopping smarter, and plating smaller portions. He said those little changes can actually make a difference in reducing greenhouse gas emissions. Instead of Leaving Leftovers to Rot, Why Don't We Turn Them into Electricity? Wasting around 40 percent of all the food produced in the U.S. certainly has its drawbacks: It's not feeding people in need, it's expensive and it does a lot of environmental damage.